THEY didn’t like me, the lassies in the soap works. It was my nearly white hair and my pale eyes. They called me a witch. But I was born like that. Still, witch or no, I think they were jealous when I got myself a bonny laddie. He’d arrived on a whaling ship. It had anchored near his village to take on water or fish or the like, and he’d hidden himself below deck until they sailed away through the frozen wastes. For Scotland, and Leith. The women looked forward to the boats coming back after months at sea, because they brought sweethearts home with pockets full of siller for buying trinkets. But me? I just liked watching the goings-on at the harbour. And then I met John. 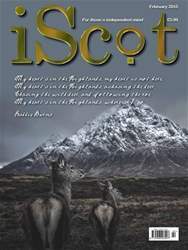 iScot Magazine February 2017 100 jam packed pages of the best craic in Scotland from the only truly independent pro Scottish magazine.